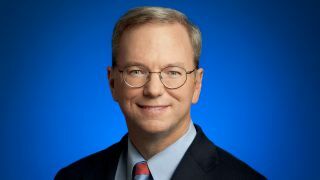 Google chairman Eric Schmidt has stoked the fire of the ongoing Android vs iPhone smartphone rivalry by claiming the battle is almost won. Speaking to Bloomberg, Schmidt said the dramatic swing towards Android handsets is reminiscent of Microsoft's Windows sweeping aside Apple's computing platform in the early 1990s. Android's market share rose to a formidable 75 per cent in the third quarter of 2012, compared with the iPhone's 15 per cent, prompting Schmidt to rub a truckload of salt in the wound. He said: "This is a huge platform change; this is of the scale of 20 years ago - Microsoft versus Apple." "We're winning that war pretty clearly now," he added, claiming 1.3 million Android devices a day are being activated. However, while Android is destroying the iPhone in terms of OS market share, Apple rakes in unprecedented profits on hardware sales, while Google simply gives away its operating system. Schmidt says the openness of Android gives Google the chance to push users towards its other services and cash in further on ad sales. He added: "The core strategy is to make a bigger pie. Schmidt is obviously feeling super-confident about the future, but perhaps his bravado went a tad too far when he claimed Google+ "is a viable competitor to Facebook."